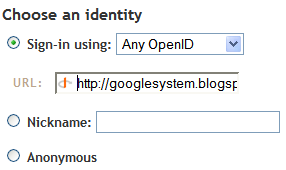 Blogger has recently added support for posting comments by authenticating with OpenID. The integration is now live for all Blogger blogs and that means you no longer have to show your identity by using a Google account. You already have an OpenID if you have an account at AOL, WordPress, LiveJournal or at one of the other OpenID providers. You can be your own OpenID provider, but this is a little more complicated. Now you can use your domain or subdomain everywhere you're allowed to enter an OpenID. To post a Blogger comment, select "Any OpenID" from the drop-down and enter your URL. You'll be redirected to the OpenID provider to enter your password. Google removed the option to enter your URL when you don't sign up with a Google account, but you can still show the URL if you use OpenID. Update: Blogger brought back the option to enter a URL when post unauthenticated comments. but can i use my google id as an openid? No, at least not yet. But Brad Fitzpatrick, OpenID's creator, is now a Google employee. My OpenID delegation works everywhere except in Blogger.com. here it says it is incorrect URL. I set my MyOpenid to Cmadras.com. Here I tried it doesn't work. I tried it here and it works (see the second comment). Ah, thank god they finally added it back. More evidence Google is getting too big for its britches: people using Google's Page Creator (with or without Google Apps for Your Domain) are NOT able to edit the header section of their homepage! So Google's own members can't use OpenID the way Google suggests! Page Creator will be replaced soon with JotSpot, but I'm not sure if JotSpot offers more control in this regard. I just noticed this earlier in the week when posting on Fake Steve Jobs' blog. It's a great move. But having to enter my URL all the time is a real pain. Only my OpenId shows here not the delegated domain. Who Are My Gmail Contacts? Will Google Give Up on Universal Search?